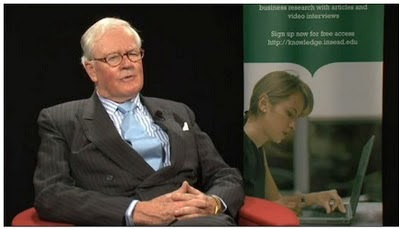 Here is a video of an interview I conducted recently at INSEAD with Sir Win Bischoff. He is the current chairman of Lloyds Banking Group and was the chairman of Citigroup in the Fall of 2008, during the worst of the financial crisis. We talked about the days around the fall of Lehman Brothers and his views on the current debate on financial regulation. Click on this link to access the video (which is hosted at the INSEAD YouTube channel). Maybe the Euro was not such a bad idea.